Has Realpolitik Arrived to Middle East? The Vienna meeting on Syria could have produced unexpected results or no results at all. The first success was achieved at the stage of forming «the chosen group of powers» invited to discuss the issue. After four years of arbitrary discrimination Iran became a party to the parley. The Vienna parley kicked off on October 29 as the diplomats of Russia, the United States, Saudi Arabia and Turkey got together to be joined the next day by their counterparts from Egypt, Iran, Iraq and Lebanon, the inclusion of which into the negotiation process on Syrian crisis management is an important breakthrough achieved by Russian diplomacy. The main reason for transition from political adventurism to Realpolitik is obvious. It was defined in the article In Shift, U.S. Invites Iran to Join Syria Talks written by Jay Solomon and Felicia Shwartz and published by The Wall Street Journal. The piece reads, «This recent tack toward the Syrian dictator marks a significant U-turn from earlier U.S. demands that Mr Assad leave office, and together with the shift on Iran, highlights the increased leverage of Russia and Iran after they jointly launched military operations in defense of Mr Assad last month». «The U.S. and its Arab allies previously blocked Tehran from participating in United Nations-backed talks on Syria». add the authors. In his remarks at the press-conference after the Vienna October 30 talks, Russian Foreign Minister Sergey Lavrov said, «One of the most important agreements of today's meeting is that the talks’ participants are asking the UN to gather representatives of the Syrian government and the opposition to begin the political process». According to him, this political process should provide for all sides to create «an inclusive structure» that will help to prepare a new constitution and hold elections that should be controlled by the UN. All Syrian nationals should be able to take part in the elections, including refugees in other countries, the top Russian diplomat stressed. He noted that all 19 parties attending the talks agreed that terrorists must not be given a chance to seize power in the country. 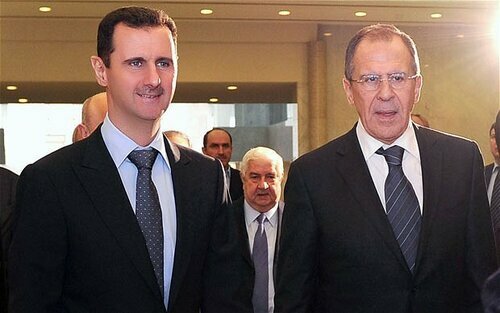 «If a ceasefire is declared, no terrorist organizations should be subjected to it,» Lavrov added. A comprehensive list of terror groups operating in Syria will be defined during a separate meeting. The final declaration on the results of the Syria talks in Vienna states, «Da'esh, and other terrorist groups, as designated by the U.N. Security Council, and further, as agreed by the participants, must be defeated». The document says, «Syria’s unity, independence, territorial integrity, and secular character are fundamental. State institutions will remain intact». The declaration stresses the need to put an end to the hostilities between the government troops and the forces of opposition. There is a long road ahead to stable peace in Syria. It is important that during the Vienna talks the demand for ousting Assad, that was stubbornly imposed by Washington, was taken out of the agenda. The narrow circle of involved actors (the United States, Turkey and the Persian Gulf monarchies) no longer has the monopoly on deciding the fate of Syria. Despite the obsessiveness related to the personality of Syria’s President, the Vienna meeting has made some progress, a step forward towards realistic approaches and a new pattern of international relations, no matter how small and barely tangible it may seem. Perhaps, that’s what Henry Kissinger, a seasoned expert on international affairs, meant in his article A Path out of Middle East Collapse published by The Wall Street Journal ten days before the Vienna talks. Henry Kissinger has served as National Security Advisor and later concurrently as Secretary of State in the administrations of Presidents Richard Nixon and Gerald Ford. He pioneered the policy of déte https://en.wikipedia.org/wiki/D%C3%A9tente» with the Soviet Union. Normally, his opinion is taken into consideration in both Washington and Moscow. The Realpolitik expounded by Kissinger springs from the ideas of Bismarck. There is a big difference between his views and the policy advocated by the current US National Security Council. Many US commentators have emphasized the difference. For instance, that’s what one of them – James Lewis – wrote in The American Thinker. According to him, «Henry Kissinger is still (to my mind) the wisest foreign policy analyst in the land». The Kissinger’s most crucial point is as follows: «If nuclear weapons become established (in the Middle East), a catastrophic outcome is nearly inevitable. Well, Obama and Europe have just handed the nuclear key to Iran, and Saudi Arabia is shopping for its own. Pakistan is selling. Are we in «inevitable catastrophe» territory yet? Our delusional liberals have been whistling past that graveyard to protect Obama. But the next president won't have that option. Putin just said that «some American politicians have mush for brains», and that isn't just braggadocio». Evidently the «delusional liberals» have messed things up during the Obama’s period. Syria is a good example to strike an eye. Only 5-7 years ago President Bashar Assad was quite an acceptable figure, even a partner. True, his rule was authoritarian, but no more authoritarian than the rule of the monarchies in the Persian Gulf. Then US officials with «mush for brains» proclaimed the beginning of «Arab Spring» and started to call Assad a «bloody tyrant». Now the world politics became focused on toppling the «unacceptable Assad». Will the news coming from Vienna on October 30 become a turning point to make the Middle East situation evolve in a different direction? The hope is dim, but not completely dashed. Let me cite Kissinger, a realistically thinking man, again. «As the terrorist region is being dismantled and brought under nonradical political control, the future of the Syrian state should be dealt with concurrently. A federal structure could then be built between the Alawite and Sunni portions. If the Alawite regions become part of a Syrian federal system, a context will exist for the role of Mr Assad, which reduces the risks of genocide or chaos leading to terrorist triumph». Actually, by and large that’s what should be done now. We should hope that the military operation launched by Russian Aerospace Forces in Syria at the impeccably chosen moment was the real beginning of Realpolitik in the Middle East.